On long adventures, Timbuk2's Goody Box makes for an easy and convenient way to keep a bulk of nutrition or ride essentials accessible on the go. 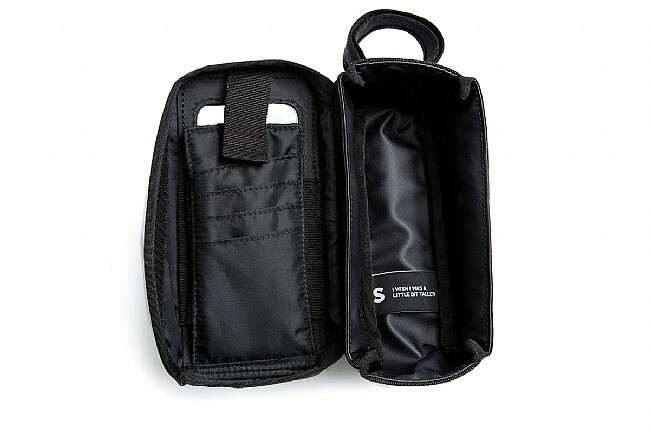 This top tube bag uses secure hook-and-loop attachments for a secure fit on virtually any bike frame, and inside, there's a phone pocket with a clear touch-usable window, card / cash slots, and room for a combination of food, a patch kit, a spare tube, or any other must-haves. The TPU liner keeps everything dry inside, but a separate stretch pocket on the outside can hold items not affected by the weather. Features reflective accents. Available in multiple colors. Great bag and worth buying Timbuk2 products through Westernbikeworks! This bag supports my MotoZ Force Droid, a 29er tube, levers, ring tools, 2-CO2, money clip wallet, and still have room about 30% after all that. This newly designed bag keeps moisture out a lot better than previous Timbuk2 bags!